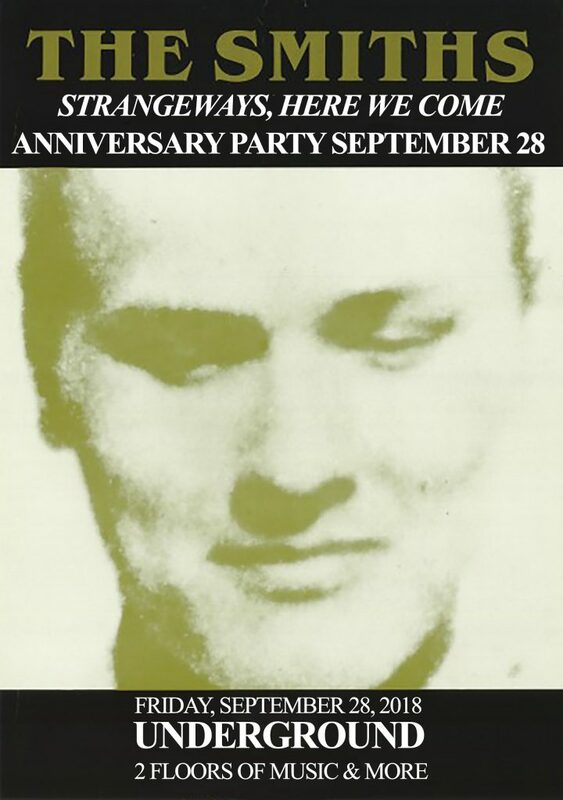 The Smiths, “Strangeways Here We Come” Anniversary Party! This month marks the release (Sept 28, 1987) of The Smiths classic album, Strangeways Here We Come. Considered by many to be The Smiths finest and sadly, their last album as a band, Underground plans to celebrate accordingly with 2 FLOORS of The Smiths, Morrissey and more! Guest DJs Ray & Alex of The Smiths/Morrissey Convention joins DJs Larry G. Friday, Sept 28th to celebrate Indie Icons, The Smiths. Join the Underground as we honor The Smiths and the bands/music they influenced since they burst onto the scene. including The Stone Roses, Oasis, Libertines, Suede, Blur, Pulp, Interpol to name a few. Get yourself ready for the floor as DJs Larry G, Alex & Ray (Smiths/Morrissey Convention) will have you Oscillating Wildly all night long to the sounds of The Smiths & more, Friday, September 28th! There’s a club if you’d like to go to dance your legs down to your knees and celebrate Strangeways Here We Come. Prepare for a filled with Underground’s non stop indie/post-punk/new wave/electro pop dance tunes along with LA’s cutest crowd, and FREE collector posters and badges!! Expect to hears tons of: The Smiths, Morrissey, Blur, Interpol, Crystal Castles, Joy Division, Bowie, Depeche Mode, Arctic Monkeys, Marvelettes, The Strokes, The Cure, Pulp, Yeah Yeah Yeahs, Duran Duran, Libertines, Amy Winehouse, New Order, Suede, Grimes, Belle & Sebastian, Ladytron, Elastica, Talking Heads, Soft Cell, Daft Punk, Supremes, Gang of Four, T-Rex, The Jam, Pet Shop Boys, Devo, T-Rex, Cut Copy, Siouxsie & The Banshees, Saint Etienne, Blondie, Oasis, Bauhaus, OMD, Supergrass, Human League & More!